For collaborative creation of documents, Google Documents was a game-changer because of how easily it let people work on the same document together, with people able to make changes, see those changes in real-time, and even see where other people are looking on the same document. We want people to be able to make VR experiences with each other just as easily, whether it's with your colleagues or classmates. 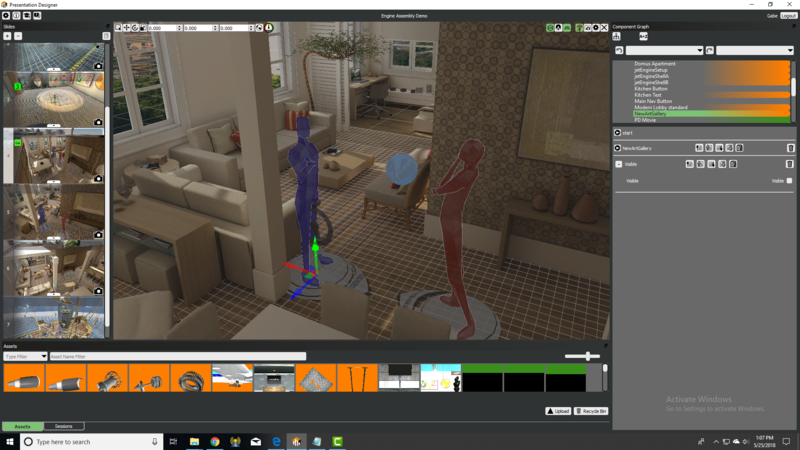 That's why we brought these same collaborative creation features to the Vizible Presentation Designer, our no-coding VR creation tool that lets people create interactive VR presentations and then hold immersive, multi-user meetings with them. Now, so long as you share your Vizible Presentation within your Organization (just like sharing a Google Doc), multiple people at once can work on the same Presentation. If multiple people have the same Vizible Presentation open and are working on it simultaneously, you'll see what slide or scene people are working on, and you'll see any changes they make reflected in real time. The image above is a screenshot of the Vizible Presentation Designer that I took while working on a VR Presentation with one of my colleagues. If you look at the slide view on the left, you'll see the little green squares that let you see the initials of other users who are viewing or working on a particular slide. I can tell my colleague has the Presentation open and is working on Slide 3. In Vizible, each "slide" represents a separate 3D scene. To put it simply, we think these collaboration features will help people build virtual reality experiences faster and better. It's never been easier to create Virtual Reality Presentations, and we're working to make it easier all the time. You can try Vizible for free and start doing collaborative VR creation by signing up here.